Here are some of the best US Virgin Islands and British Virgin Islands Scuba Sites that you can explore on a Scuba Diving Charter. Navy Barge s– 45ft. Novice ~ Intense rib structures of several sunken World War II ships are wild to explore among the coral and reef fish inhabitants. Favorites for photography. Stone Face – 50ft. Novice ~ Weave through rows of coral encrusted fingers reaching shoreward to 10 feet filled with marine life. Dry Rocks – 30-70ft. Novice ~ Tropical, pelagic and reef fish abound among these grottos and overhangs in crystal blue water. Occasional turtles and sharks add to the thrill. Flat Cay – 20-70ft. Novice to Intermediate ~ A vast playground for fish and sting rays at a variety of depths to explore. Easter Reef – 80ft. Advanced ~ A sea mound that is home to a slew of fish, from tiny bassets to a shy Jew fish and free swimming eels, rays and sharks. Carval Rock – 20-80ft. Advanced ~ Dramatic rock formations loaded with coral and sponges. Eagle Shoals – 45ft. Novice ~ A remote site off St. John’s southeast side with curious caves and exhilarating swim throughs. Coconut Reef – 45ft. Novice ~ 20-30 foot coral head, teeming with marine life. Two resident eagle rays and often 200 + in schools of chub. The Aquarium – 35ft. Novice ~ A sandy bottom strewn with giant granite boulders similar to those found at the famous Baths, some rise to within 10 ft. of the surface. An oasis that attracts some of the largest schools and varieties of reef fish in the BVI. The Invisibles – 60ft. Advanced~ A pinnacle rising to 4 feet from the surface with a preponderance of sponges and soft corals with vibrant color. The strong currents bring in volumes of fish including a large school of permit. Bronco Billy (George Dog) – 45ft. Novice ~ An archway leads to a shallow canyon through the reef. One the other side the reef curves to create an amphitheatre effect with soft and pillar corals in the center. Grottos provide areas to look for fish, lobsters and eels. Joe’s Cave (West Dog) – 45ft. Novice ~ Fabulous underwater topography of large boulders creating holes and ledges to explore. The cave is a triangular crack in the rock that is open to the air at the top and widens at the base so divers can swim into a spherical chamber. The Chimney (Great Dog) – 45ft. Novice ~ A canyon leads through a spur from the island and as you swim through, the walls come together in a natural archway covered in multicolored sponges and delicate orange cup corals. Swim through the narrow crack at the other end to exit. Alice in Wonderland – 65ft. Novice to Intermediate ~ A healthy spur and groove coral reef slopes up toward the South side of the island with large mushroom shaped coral heads that shelter fish, lobster and spotted morays. The abundant live corals are a true wonderland. Alice’s Backside – 45ft. Novice ~ The perpetually calm Northside is a restful dive with a huge reef slopping from 25 feet down to a 50 foot sandy bottom. Ginger Steps – 90ft. Novice to Intermediate ~ 3 steps tucked against the calm South Bay boasts some of the healthiest star and brain corals in the BVI with numerous fish species. Carvel Rock – 70ft. Advanced ~ A large rock facing the open ocean currents is visited by larger pelagics, reef sharks, barracuda and mackerel. Cistern Point – 40ft. Novice ~ Unique cistern-like holes in a reef. Look for eels and nurse sharks. Devil’s Kitchen – 50ft. Novice to Intermediate ~ On a calm day dive this shelf that becomes increasingly undercut forming a Swiss cheese lattice hideout for reef fish, lobster, large snapper, turtles and tarpon. Dry Rocks East – 80ft. Intermediate to Advanced ~ A favorite among local dive leaders for the unusual marine life that is driven in by currents such as African Pompano, Atlantic Spadefish, Hawksbill turtles, Cobia, Nurse Sharks and schools of Horse Eye Jacks. Dry Rocks West – 40ft. Novice to Intermediate ~ A pinnacle which barely breaks the surface offers one of the most abundantly colorful dives memorable for even the most experienced diver. Marie L & Pat Wrecks – 85ft. Intermediate ~ A cargo ship and a tug boat that were sunk in the early 1990 are interesting features to explore. A colony of Garden Eels and a brave bunch of sting rays that often swim to divers are not to be missed. Wreck of the Rhone – 15-90ft. Novice ~ Regarded as one of the best wreck dives in the Caribbean. At the bow (30-60 ft) divers can swim inside the ship hold to see coral encrustations and a multitude of fish species. Outside the wreck, the foremast and crowsnest can be seen. At the stern (15-30 ft.) lobsters and octopus hide in the metal of the boiler, rudder and propeller. Ringdove Rock – 15-70ft. Novice to Intermediate ~ spiral up and around a fertile mound teaming with marine life. Spyglass Wall – 10-60ft. Novice ~ a mini wall with Sea Fans and large coral heads. Bright Damsel, Wrasse and Fairy Basslets are abundant. Look to the blue for foraging Tarpon and Rays. Brown Pants – 10-40ft. Novice to Intermediate ~ A network of ridges form rocky canyons and an open cave. 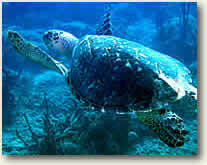 Turtles, Barracuda, Queen Angels and White Spotted File Fish are sited. Santa Monica Rock – 20-70ft. Intermediate to Advanced ~ A giant pinnacle covered with fire coral and nooks and crannies that hide fish and attract pelagics, Spadefish, Kingfish and Jacks. The Indians – 10-50ft. Novice ~ A unique rock formation that juts out of the ocean. Divers can pass through a tunnel to the other side as they view abundance reef fish and corals. Shark Point– 25-80ft. Novice to Intermediate ~ Open ocean where visibility can be exceptional for exploring life among the soft corals through a maze of alleys and caves. Carrot Shoal – 10-60ft. Novice to Intermediate ~ 200 foot ridge rises from 60 feet proving home for even the shy Long Snout Butterfly Fish. Black Forest – 30-70ft. Novice ~ A mini reef wall that hosts a variety of reef life including the endangered Black Coral. The Fearless – 40-80ft. Novice ~ 100 foot wreck that is now home to an array of schooling fish such as Soldier Fish and Creole Wrasse with nooks for Blennies and Gobies. See Scuba Dive Instruction for live aboard dive boat info and courses.